Secure Enterprise WiFi Networks & Amped Up SAML Access! New year, new software update, new features! And we’ve got some goodies for you which will definitely tickle your tech-loving fancy. Yodeck’s got your security needs covered with support for Enterprise WiFi Networks – and we’re offering it to all plans! We also improved SAML access support for our Enterprise subscribers. Support for Enterprise WiFi Networks is here! If you are beefing up your WiFi security or already use Enterprise WiFi Networks, then you’re in for a treat! You can now set a username and password for your WiFi access, quickly and easily, right in the Yodeck app. It’s super handy for companies and schools. And all plans get it, Standard too. We’ve taken our SAML support to the next level to meet the ever-evolving needs of bigger corporations – and our Enterprise subscribers of course! 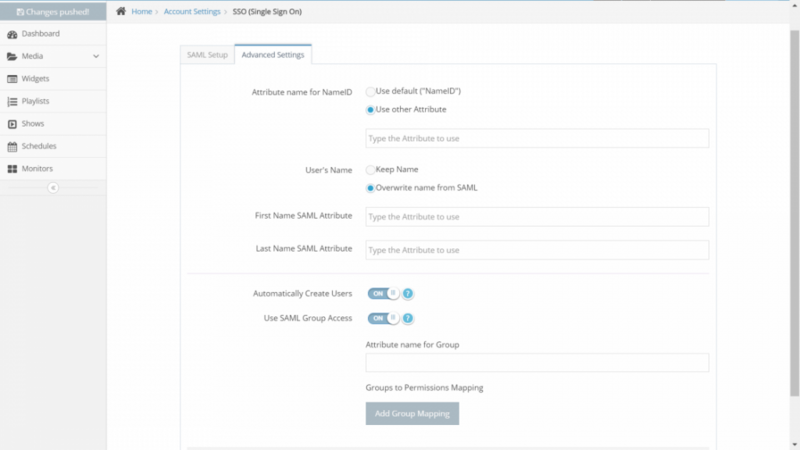 New Yodeck users logging in through SAML now get created automatically and all the correct Yodeck user permissions are also automatically applied. Yodeck now offers improved SAML access support, which is great for big organizations! New Yodeck user accounts get created automatically and all the correct Yodeck user permissions are also automatically applied. Support for Enterprise WiFi Networks is here! 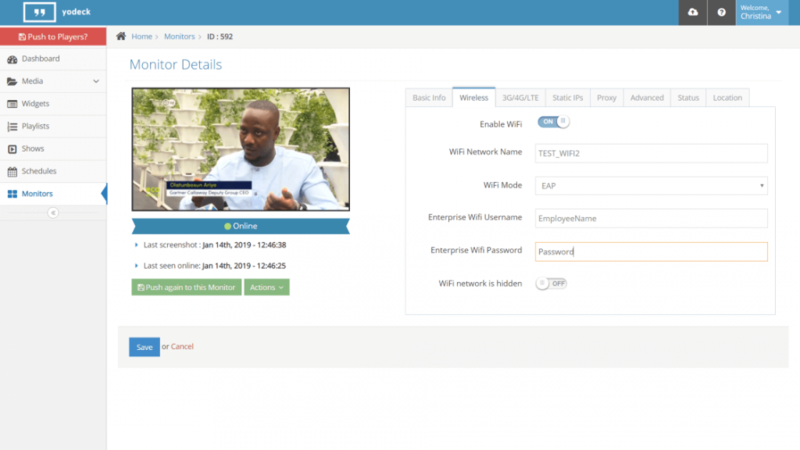 Now bigger enterprises who use this type of WiFi security can quickly and easily define both a username and a password for WiFi access in the Yodeck Portal. We set the volume to 100% on each boot for consistent sound volume. We also increased the capacity of our video encoding procedure to shorten the waiting period. If you have an account with existing monitors set up and add more screens, the last show you created appears as preloaded content in your new screens. Twitter Terms & Conditions have now been added. Now you can go straight to each media item from the Show Editor. Click the arrow next to each content item in the list of media layers. We also changed the rich text font sizes and made them smaller to make them easier to use. A message now pops up if you repeatedly request too many image search results in our Image Gallery feature. When you duplicated Media in a new Workspace, the details were copied wrong and the media item wouldn’t work; fixed it! We also fixed an error that occurred when you moved a Web Page from one Workspace to another. We fixed a bug so YouTube streams now play properly. And we fixed a bug where an invalid schedule file message appeared when download timeslots are used.